No one told me about Sniping! Back when I first started playing Team Fortress 2, like a lot of people, Sniper always sounded like a good place to start. It all sounds so simple. Stand far away from everyone else, zoom in with your pretty scope and shoot people from a safe distance. Wonderful, right? Oh so very, very wrong. No one mentioned Spies. Or Pyros. Or Demomen. Or Scouts. Or Soldiers. No one said that everyone would suddenly hate your guts the second you picked up that rifle. No one said that five Snipers is too many. And not a single soul told me how hard Sniping actually was. “Snipin’s a good job, mate!” No, it bloody isn’t. Maybe I’m being a bit harsh. But when you start playing a new game, most of the time, you start with easier things and work your way up. Because Sniper looks easy, people seem to flock to him, even more so than people do with invisible secret agent man. Playing Spy looks fairly challenging. Standing around shooting into the distance not so much. It’s not Sniper’s fault though. We can’t blame him for being good-looking and being instantly recognisable as a common class in most first person shooters. We CAN blame him for throwing piss at people, but that’s beside the point. 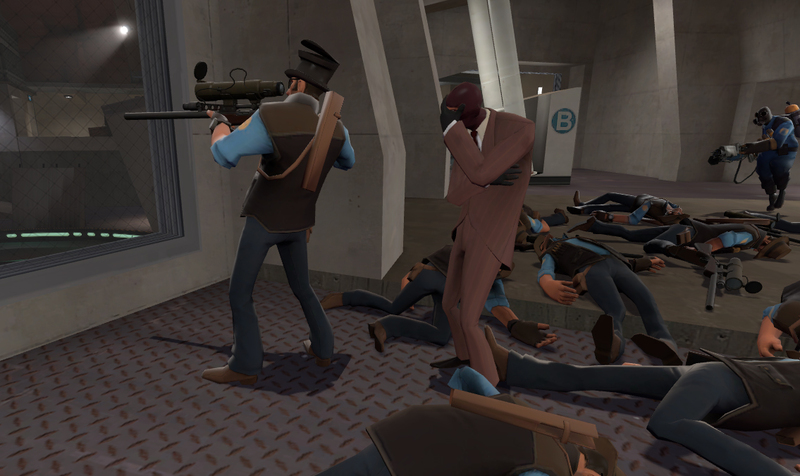 Let’s face it, Sniper is even more deceiving than Spy when it comes to new players. − Zoom in to deal more damage. − Sniper is not recommended if there are currently more than two on your team. − You cannot shoot through glass or other translucent objects. − Spies will try to kill you. If you see someone suspicious, shoot them. − Do not pick Sniper if you can’t aim! Why I Hate the Half-Zatoichi Why you really, really should not be a Battle Medic. Three Reasons we have a Dearth of Heavy articles Is Scout really a “Generalist” class? Sniper Taunts vs. Spy Taunts? Way back when, medic was the first class I played, mostly out of fear of being completely useless to team. Figured at the very least I could give them health.